Our secluded campsites sit next to the beautiful Delaware River. They are fully shaded by wise old trees and overlook the water gap. Worthington State Forest is about 2 hours from Philadelphia or the Jersey Shore, making it the perfect distance for a mini getaway. The State Park has modern toilet and shower facilities. Women ages 21+ who are interested in stepping out of their comfort zones and into empowerment with the support of a sisterhood. Women's Weekend attracts goddesses from all phases of life - maiden, mother, and crone. We share our personal journeys and life experiences and find the ways we are all connected while honoring our unique perspectives. This is the perfect getaway for girlfriends wanting to grow closer, mother/daughters wishing to explore their bonds, and women in transitional times of life. Come alone or with friends/family - we all leave as Sisters. This special weekend allows us to reconnect with our Divine Feminine, the intuitive and powerful Woman. 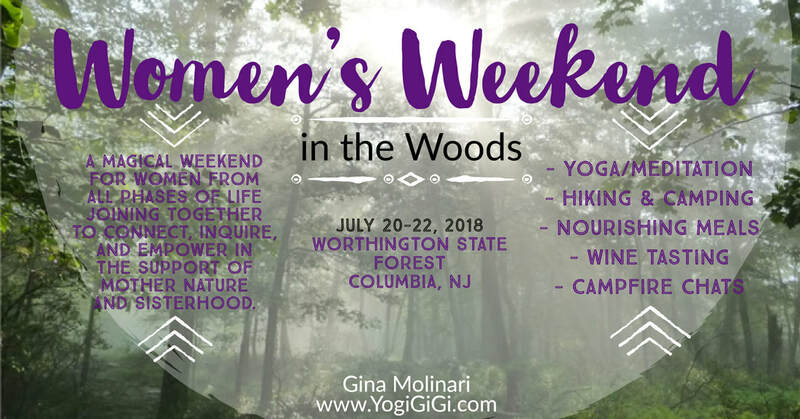 We will immerse ourselves in Mother Nature by hiking in the mountain trails, practicing yoga and mindfulness outside, and of course, camping! What would a girls' getaway be without a little wine? On Saturday, we'll take an excursion to a local Skylands winery for wine tasting (included, but no pressure to partake). Nourish your body with healthy, Ayurvedic inspired meals. Feed your soul with deep talks around the campfire. Open your mind by expanding your comfort zone to embrace Mother Nature's ability to challenge and support us as we learn how to connect with her and each other. Women work hard to meet the needs of a traditionally masculine society. Mother Nature is the ultimate host to reconnect with the Goddess within so you can discover the feminine that may have been buried, the bonds with your Sisters that may have atrophied, or the flow within the cycles of your life. This weekend is designed for you to step away from the busyness in order to find respite and connection in the woods. You'll laugh and cry together. There's time for fun (and wine!) and time to do the hard work of heart work, all in a safe and supportive environment. You deserve a break. Join us in the woods. Do you need a Midsummer Girls Getaway? Fill out the form for details and an application.